The best options for your home. Special offers available in your area. Learn more about your energy use. Your energy providers and partners. The reasons behind our message. Get acquainted with products that deliver both efficiency and convenience. rate of 11 cents per kilowatt-hour. Efficient home lighting just keeps getting better. An icon of energy efficiency, Compact Fluorescent Lights (CFLs) are more versatile, and produce a higher quality light than ever. A more recent innovation, Light-Emitting Diodes (LEDs), offer even more efficiency, which is part of the reason their popularity is on the rise. Rebates vary by provider. Find out what yours has to offer. Modern CFLs produce quick-start, flicker-free illumination, and there are models compatible with dimmer switches. There are also CFLs designed for use in most types of fixtures. From three-way lamps, track lighting, recessed can lighting and outdoor uses, there’s a CFL for the job. And because of their longevity, CFLs significantly reduce the chore of physically replacing burned-out bulbs—an especially nice bonus when considering those difficult-to-reach areas. And they not only last longer, they use around 2/3 less energy than incandescent bulbs for the same amount of light output. This efficiency translates into around $40 in savings over the life of the bulb. 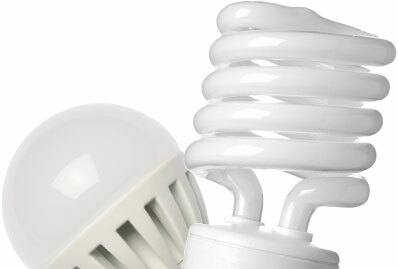 CFLs are available in several different colors. And it’s more than just personal preference. Some light colors lend themselves well to particular places and activities. Warm White and Soft White are the standard colors of incandescent bulbs, and are also available with CFLs. They’re perfect for those who enjoy the appearance of incandescent-bulb lighting, but also want the efficiency of CFLs. Some colors lend themselves well to particular places and activities. Cool White and Bright White are ideal for kitchens and workspaces. And CFLs marked Natural or Daylight are perfect for reading. Look for the ENERGY STAR® logo for high-quality CFLs with independently verified performance, and a minimum two-year warranty. Be sure to pay special attention to the packaging of CFLs to make sure you’re getting bulbs compatible with your fixtures and personal preferences. For information about the evolving system for labeling lighting products, visit LumenNow.org. When screwing in CFLs, hold the ballast (the white plastic area), not the glass tubing. This will reduce the chance of breakage. LEDs produce light in a whole new way. They provide excellent light quality while using at least 75% less energy than incandescent bulbs, making them one of today’s most efficient lighting technologies. And the world has noticed. New LED products are being developed at a rapid pace. Plus, since they give off virtually no heat, they can also help save on air conditioning costs. This cool-to-the-touch attribute also makes them the safest choice in home lighting. And since they’re extremely durable, they erase any concern over bulb breakage. Even the outdoor elements are no match for LEDs. Certain outdoor LEDs feature automatic daylight shut-off and motion sensors. Look for the ENERGY STAR® logo for high-quality LEDs with independently verified performance, and a minimum two-year warranty. Be sure to pay special attention to the packaging of LEDs to make sure you’re getting bulbs compatible with your fixtures and personal preferences. For information about the changing system for labeling lighting products, visit LumenNow.org. Privacy + Sources + Contact + © Copyright 2018 Great River Energy. All Rights Reserved.